It's a very poor country of western Africa (third from last of the World), with very dry tropical climate, with great droughts, without way out on the sea. Almost the 80% of the population is illiterate; on approximately 12 million inhabitants over 2 million work to the foreign countries, primarily in the Ivory Coast and in Ghana. It's constituted from a vast arid highland, deeply engraved by courses of water that meet in the great river: the Volta. 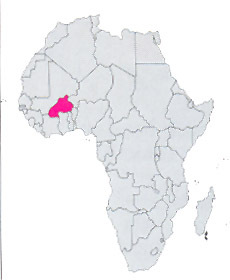 The main city is the capital Ouagadougou, that is also the most active commercial center. Wonderfull is the south - west area of the Country, with the big mosque of Bobo Dioulasso, the peaks of Sindou, the Karfiguela falls and Tengrela lake, settled by hippos.